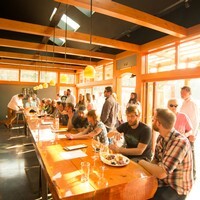 Port Townsend Vineyards has two distinct tasting rooms. The casually elegant Winery Tasting Room at the entrance to town hosts guests in a tasting room that reflects the old-world charm of the 140-year-old wood beams, artfully blended with modern stainless steel and glass. An adjacent event pavilion and outdoor patio provide upscale venues for events, dinner parties and local music. 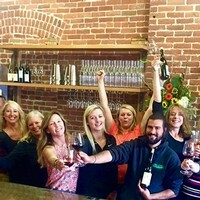 At our Downtown Tasting Room, the warmly ambient and intimate tasting room beckons those on their way to the nearby Rose Theatre or the many restaurants in Port Townsend’s historic district. Patrons can choose from cozy tables by the window, bistro tables that line the gallery of photographs, or sit at the comfortable taproom bar. Both tasting rooms offer a wide selection of wine that can be paired with plates of locally made cheese or chocolates. Our future Vintage Bar & Plaza: A new tasting room that blends the best of all worlds. Opening soon in the beautifully restored historic C.F. Clapp building located in the heart of downtown. Featuring a tasting room and a commercial kitchen, it is designed for wine tasting, dinners, cooking classes, music entertainment and other events that benefit the community.